I think I made kind of a break through in my riding. Dare I say it? It has slowly dawned on me over the last week or two that I'm not using my left seat bone, weighting my left stirrup when needed, etc. to the degree I should be. 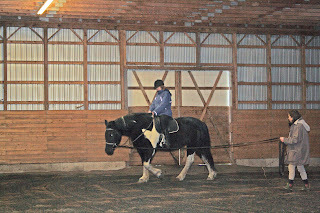 - then I gradually became aware that I was fine with the right hand stirrup weight, but whenever I tried the left it felt awkward and foreign to me - OMG - I hadn't been using the left hip for some time! When did I stop? Now I've built up tons of incorrect muscle memory. My weight is in my right stirrup almost all the time and I hadn't even realized. Joan and Cheryl couldn't see it, because except when I collapsed my hip you couldn't really see it and I usually wear baggy jackets. This helps explain the difficulty I've had with the left bend and the long time it took me to get it. Poor Rogo - I've been putting my left leg on but also my right seat bone at the same time. He's getting conflicting messages. Stiffness anyone? You can see that I've weighted the right in the above picture, even as I'm trying not to! Not me! Savanah's the wooly mammoth. I just have on many layers :) Here's Cheryl. 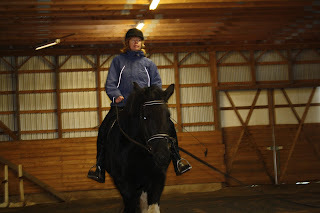 Then I hopped off and hopped on Rogo and voila - my stirrups felt way too short. I had to let them down a notch - my legs had stretched into a better position even in that one short session! 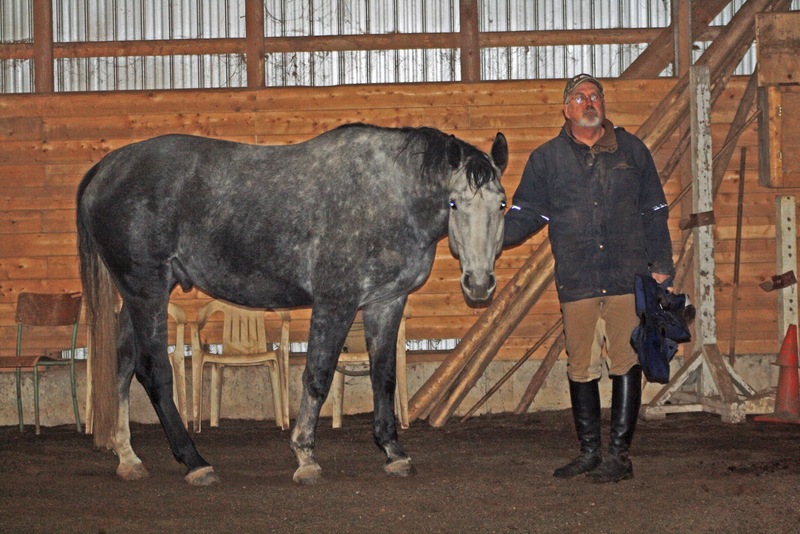 I was centered over my horse, my legs were in the correct position to push with some power, I held them on for a second instead of a tenth of a second, as Stephan suggests in the video, and it worked! I must say, when I put my legs on I shocked myself - I knew instantly that it was different, and that he'd respond and he did. I kept it up and we soared effortlessly around the indoor, even getting a lengthening - WOW! 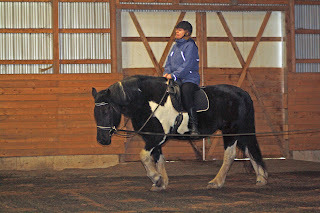 I'm still a little giddy with the whole thing :) You know how I've struggled with the trot. I wonder if it was a one shot thing, or are we finally on the right track? I think there may be back and forth time, but I think we're onto something. I MUST remember this - when things aren't working for me, I get heavier in my aids. They still don't work, so I assume he's dull in that area, that just a shift in approach won't be enough, that it will be a long struggle or trying even harder with what I'm doing. He isn't dull; I'm not doing something right. 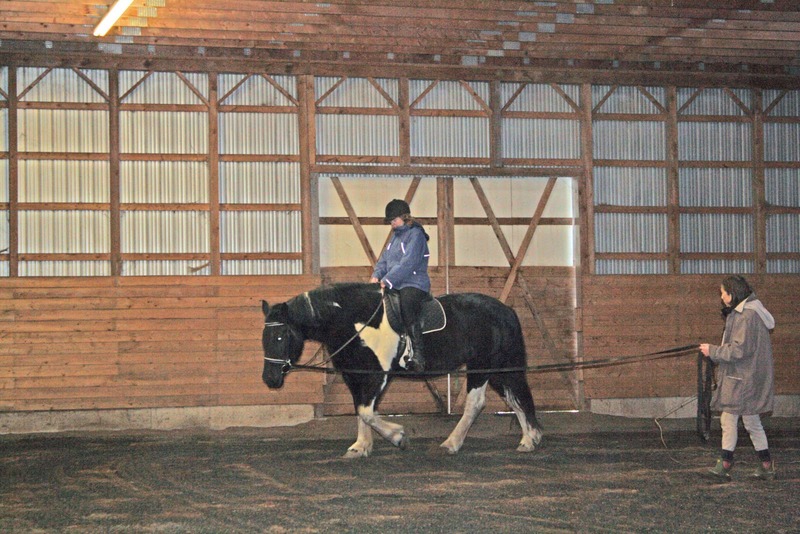 A change to balanced weight, legs on correctly and he's pushing with that hind end and light in my hands. God I'm lucky to have him. He's so tolerant of me. Doug was so impressed with both Cheryl and Savanah re the longe lesson that he's going to have one too. I'm going to make it a regular part our my routine, at least for the next month or two. All in all a great day where everything came together. I love it when that happens. Don't you just love those "Ah Hah!" moments! So great you figured out a key to the trot issue. I feel the same with Steady as you do with Rogo. If I could just figure out the right way to ask he will give me what I want. Gotta love those tolerant horses. that's so awesome, even reading this post cleared a lot up for me. i was complaining about oscar's stiffness in the left, but put it down to me being right handed and blocking him in the left rein, but it makes a lot of sense that i'm also weighting the right seat bone too. come to think of it, i'm almost certain i do. ps: savanah is definately adorable! Wonderful stuff - I know exactly what you mean. Now you're "allowing" with your seat and legs, and more balanced in your position, everything is possible. 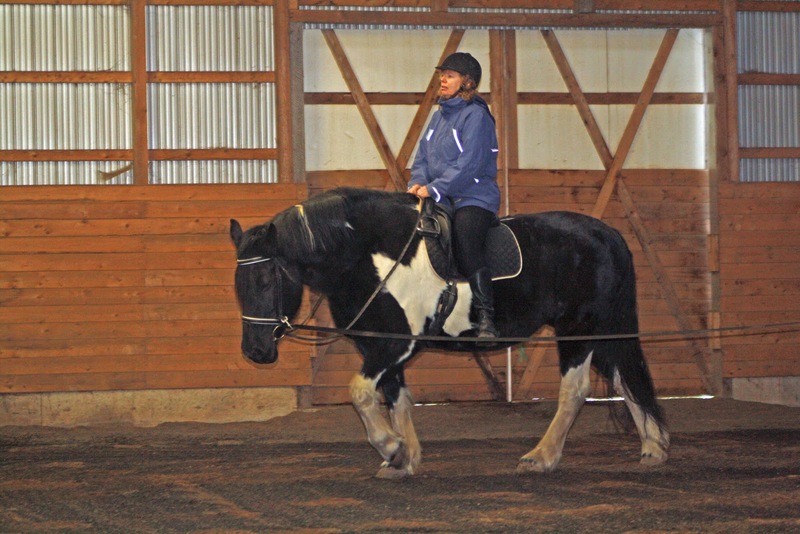 So many people are convinced their horses are dull - no horse is dull - when it's them blocking the forward motion. Sounds like you have made breakthroughs! Awesome Carol. As hard as it may be to swallow sometimes, I know it is for me - (excepting lameness / injury) the problem is always with the rider. What a wonderful epiphany! Don't feel bad- we all have little things we are doing wrong, and we feel terrible when we discover them. 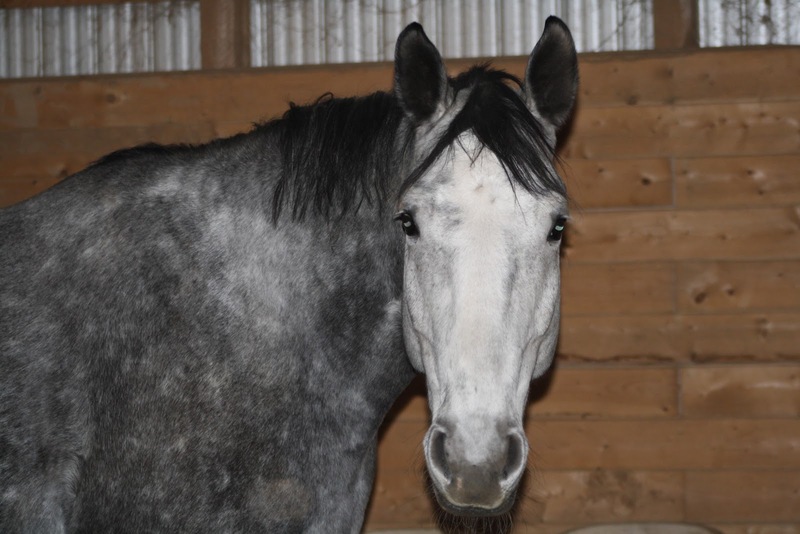 But I really think our horses are pretty forgiving of us. Having said that it happens to all of us, how terrific to learn more about your weighting a stirrup and making some changes and having your dear boy respond so well! Good boy, Rogo! And wonderful for you Carol! 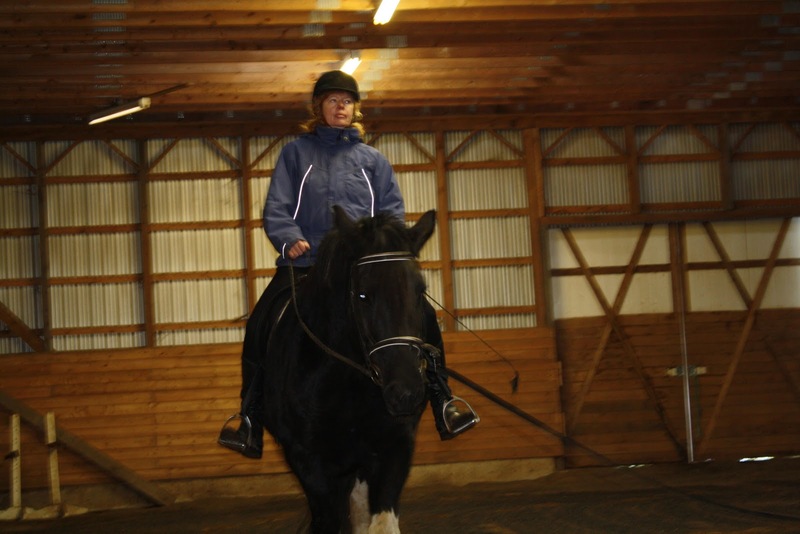 Love your posts, they make me think about my riding and make me long for more lessons!